Today in Masonic History Antonio Leocadio Guzmán Blanco passes away in 1899. Antonio Leocadio Guzmán Blanco was a Venezuelan politician. 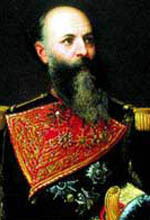 Guzmán was born in Caracas on February 28th, 1829. His father was a founder of the Great Liberal Party of Venezuela. This would directly impact Guzmán who was also a liberal. Guzmán was banished from the country between 1858 and 1859 under the presidency of General Julián Castro. It was during this time that he became closely associated with General Juan Crisóstomo Falcón. After several battles along side Falcón, Guzmán went to the West Indies seeking aid. In 1863, Falcón signed the Treaty of Coche. This led to a general assembly being called where Falcón was elected president and Guzmán vice president. At the same time Guzmán was secretary of the treasury. In this capacity he went to London to secure a loan for the country. After Guzmán's return from London, Falcón was over thrown in 1868. In 1869 Guzmán led a revolution and in 1870 became provisional president with extraordinary powers. He ruled the country as a dictator for the next seven years. From the time he took the office of the president in 1870, over the next two decades he was in and out of the presidency. The last time was from 1886 to 1887. Despite the autocratic nature of Guzmán's presidency, his administration is responsible for some major achievements generally more associated with a liberal government. Some of the items included the establishment of the Venezuelan currency, the restoration of the National Anthem, the railroad between Caracas and La Guaira, the foundation of the Venezuelan Academy of the Language, the telephone service between Caracas and La Guaira, promotion of agriculture, the Decree of Public and Obligatory Instruction of 1870 which promoted education, the abolishment of the death penalty, stimulus to commerce, and important public works which included the National Pantheon, the Capitol, and the Municipal Theater. He also created a separation between church and state by limiting the power of the Roman Catholic Church in Venezuela. In some sources it is claimed that the limiting of the churches power had something to do with his being a Freemason, there is no evidence to support this idea. Guzmán passed away on July 28th, 1899. Guzmán's lodge affiliation is not known. Several sources list him as a 33° Scottish Rite Mason. It is also claimed in some sources that he was a Grand Master of the Grand Lodge of Venezuela (Gran Logia de la República de Venezuela), there is no listing showing Guzmán was a Grand Master of that jurisdiction. Some of the more grandios claims about Guzmán's masonic affiliation seems to be used as the reason for, what some have deemed, his anti-Catholic stance with the separation of Church of State and taking the educational system in Venezuela away from the Catholic church. Guzmán did build the largest masonic temple in South America at the time.